Villa Teresinha is a charming and spacious property located close to the town of Santarem. An authentic countryside estate, with an elegant and relaxed atmosphere throughout. Villa Teresinha is a charming and spacious property located close to the town of Santarem. An authentic countryside estate, with an elegant and relaxed atmosphere throughout, this homely villa is the perfect escape for the whole family. With a surrounding of olive trees, cypresses and planes, guests can fully immerse themselves in the picturesque landscape, soaking in the daily sunshine. Throughout the villa, the furnishings are traditional, carefully chosen to create the feel of a home away from home. Each of the rooms is spacious and bright, flowing from one to the other so the whole family can spread out while remaining nearby each other. The villa itself sleeps nine guests, with six charming bedrooms. There are three double rooms, two twin rooms and a single room that would be suited to younger children. Through the villa, there are two bathrooms, one with a spacious bathtub and the other with a shower. There is a large family kitchen, fully-equipped and ready for you to cook up some delicious meals that you can enjoy on the terrace! There is a large dining table where the whole group can come together and enjoy each other's company, with the lounge located adjacent, with comfortable sofas and chairs arranged around a feature fireplace. The spacious interiors open out to a large, sunny terrace, with plenty of room for the whole group to spread out and relax. With a huge private swimming pool taking pride of place, guests can hop in and cool off on hot summer days. The pool area is gated by shrubs walls and a fence, making it extremely private for your stay. There are sun loungers, so you can lie back and top up your tan while finishing the pages of your favourite book. A covered area of the terrace houses a long dining table, where guests can dine al-fresco, socialising through the evening over a bottle or two of local wine. 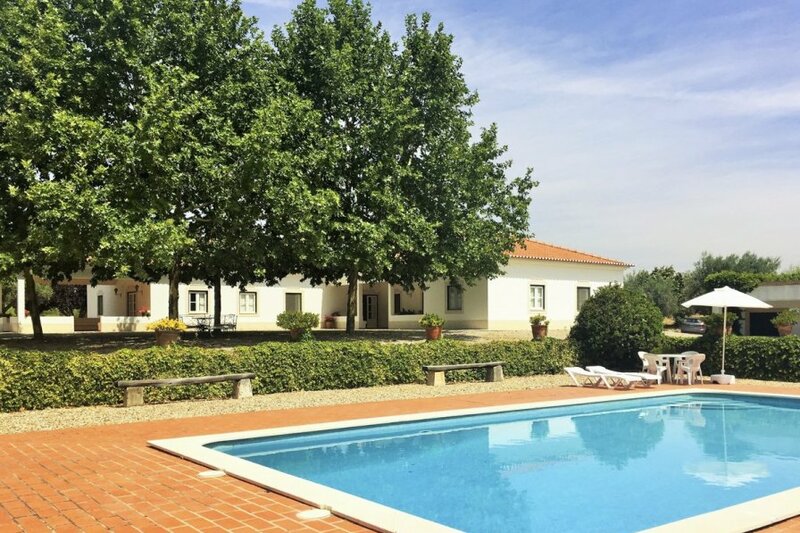 Villa Teresinha is the perfect base for exploring this picturesque area of Portugal, basking in the sunshine, tasting the delightful regional delicacies and visiting the beautiful city of Lisbon. Villa Teresinha is located just a few kilometres from the charming town of Santarem, known as the Gothic capital. With Lisbon just a 45-minute drive away and the popular towns of Fatima, Foz do Arelho and Peniche are only 30 minutes away. The fascinating nearby Santarem offers visitors a great insight into a town once renowned as the strongest fortress in the kingdom! Its origins can be traced back to the Iron Age, and its cultural events and celebrations still attract large crowds today – including the ‘Feira de Ribatejo', a 10-day agricultural fair abound with folk dancing, bullfights, bull-running and stalls of local produce! Portugal itself is a small, fascinating country at the most Western point of mainland Europe. The capital, Lisbon, is known for its lively nightlife, with endless bars and clubs full of fun-loving locals and tourists alike, but also has plenty of fascinating history (check out Belem, jam-packed with monuments!) and undulating terrain, famously termed the ‘city of the seven hills'. With a vast coastline that meets the mighty Atlantic Ocean, Portugal is a real paradise for the keen surfer, or indeed even those looking to try it for the first time, with plenty of surfing schools all along the calmer sections of the coast. Of course, it is not only the world-famous waves but also the utterly pollution-free water, and the lack of deadly sharks found in warmer areas that put it so firmly on the map as the surfing Mecca of the world. And even for those less keen on the idea of surfing, the beaches of Portugal are well worth a visit for their beautifully clear waters, and almost all have a bar at which you can enjoy a tipple. Other active pursuits include a sublime cycling trip through the undulating and picturesque scenery of Geres, or indeed white-water rafting on the river Douro! And a scenic hike through the Natural Reserve of Peneda-Geres, the Douro Valley and Serra da Estrela will allow you a real up close and personal experience with all kinds of wildlife. For those more into the gentle pace of golf, Portugal is a real haven, with 14 of the world's top 100 best golf courses!